Eau Claire SCHEELS first opened its doors in 1995 in the Oakwood Mall. In 2000, they expanded to 80,000 square feet to offer a retail shopping experience that showcases the region’s largest selection of sports, sportswear, and footwear under one roof. Unlike a typical sporting goods store or department store, the expanded Eau Claire SCHEELS is a collection of women’s, men’s, youth, specialty, and sport and game shops. Brand-name concept shops by Nike, adidas, Columbia, and The North Face will keep you active in any season. Each shop is staffed with experts who are focused on their passions. 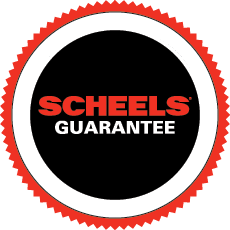 The SCHEELS in Eau Claire features boutiques ranging from technical running gear and the latest fashion sportswear to spectacular hunting and fishing shops. The athletic shoe, hiking boot, and casual footwear selection is the largest in the region, with everything for toddlers to serious climbers, and selections ranging from beach sandals to fashion boots for women. Outdoor enthusiasts will experience world-class shops including golf, bike, ski, paddle, and sport and game shops. The gun and hunting shops have the largest retail selection of guns in the region, ranging from everyday shooters to collectible guns. Gather in the Archery Shop and utilize the “try before you buy” archery shooting range, where experts are ready to fit you for a new bow or fine tune one you already own. Enjoy 24 flavors of fresh homemade fudge and Starbucks coffee and specialty drinks!